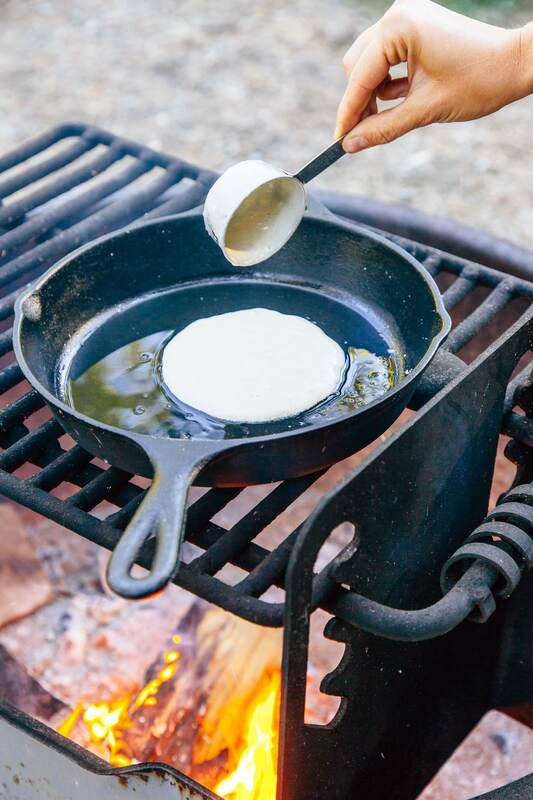 Pancakes are a pillar of American camp cooking tradition. 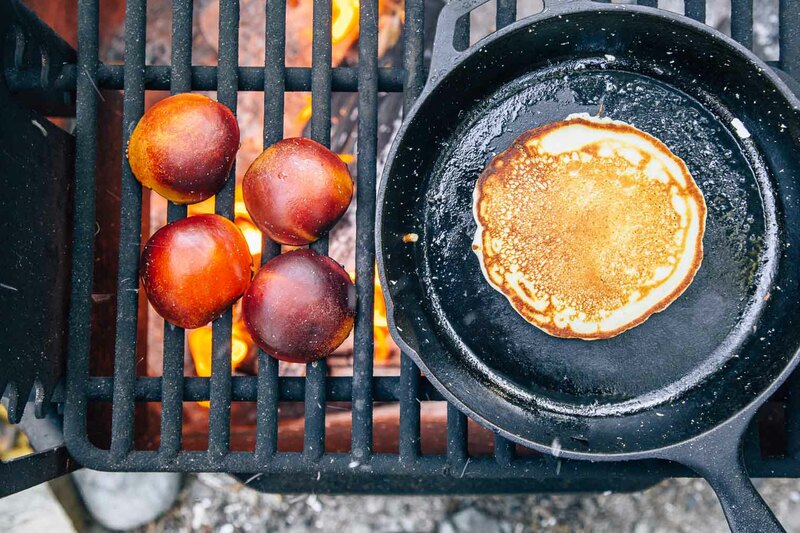 However, after a year of running a camp cooking blog, we recently realized don’t have a single pancake recipe yet. How could we have missed this? It’s not because we don’t like pancakes. WE LOVE PANCAKES. It’s just we’ve always been a little freaked out by the process of actually making pancakes. 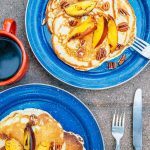 Typically, pancakes involve flour, eggs, milk, and a few other ingredients that eerily remind us of baking. 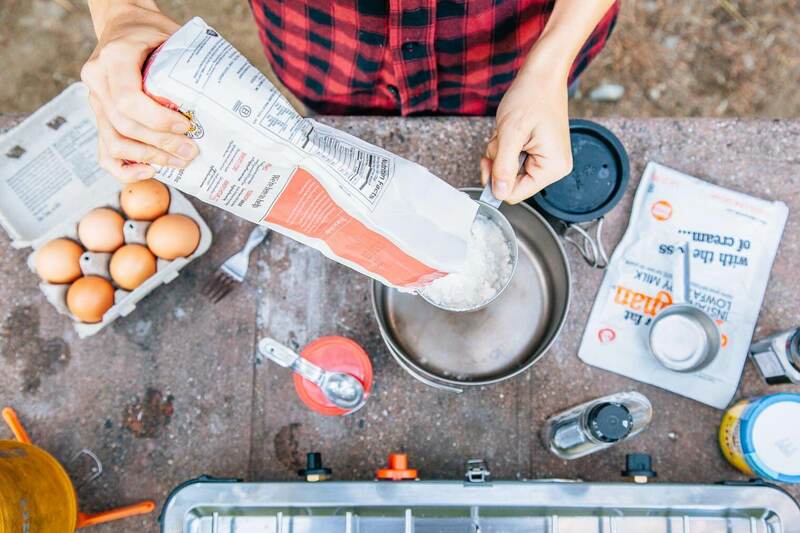 While we are hopelessly drawn to the fluffy deliciousness of baked goods, we’ve always been a little freaked out by baking ourselves – especially at a campsite. And while we know making pancakes technically isn’t baking, we’ve just never carried the right ingredients with us (i.e. flour, baking powder, milk, etc ). Thankfully all that has changed, and we have discovered just how simple it is to make fluffy pancakes, right over the fire no less! 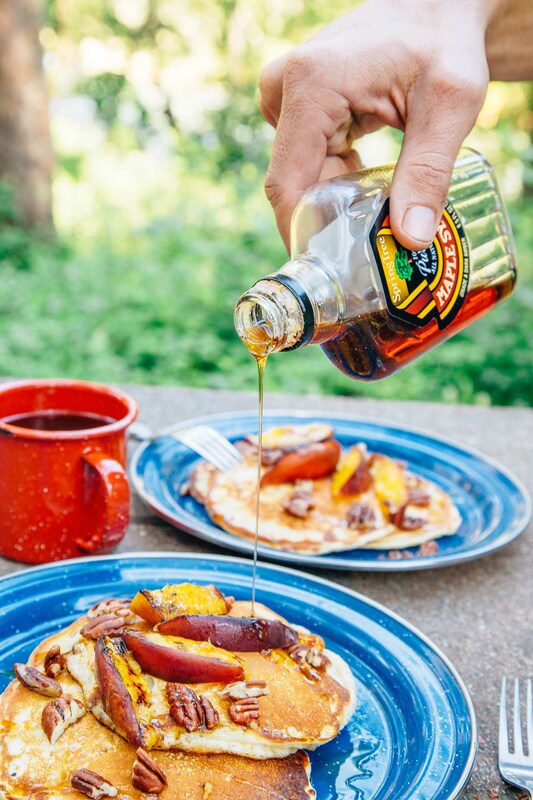 With the right ingredients and proper recipe, making pancakes at a campsite can actually be one of the easiest breakfast meals you can make! 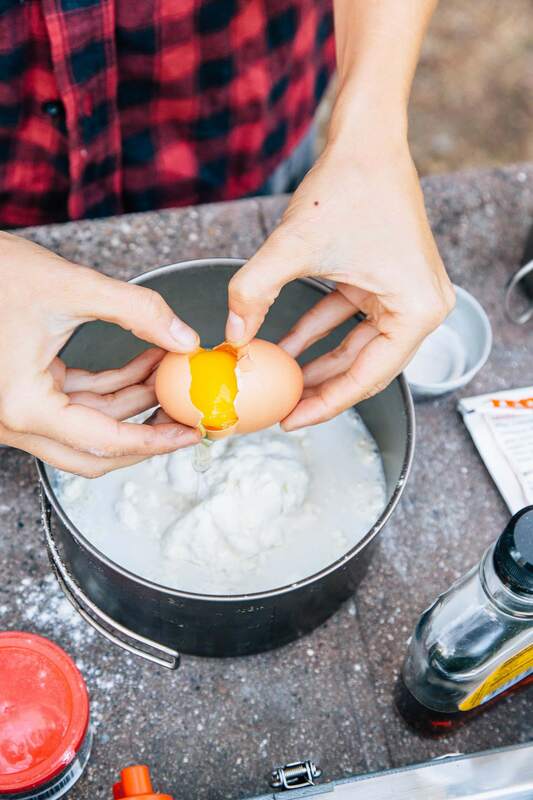 To start, we picked up a small bag of flour, a tiny tin of baking powder, a packet of powdered milk, and a small carton of eggs, and mixed everything together at camp. 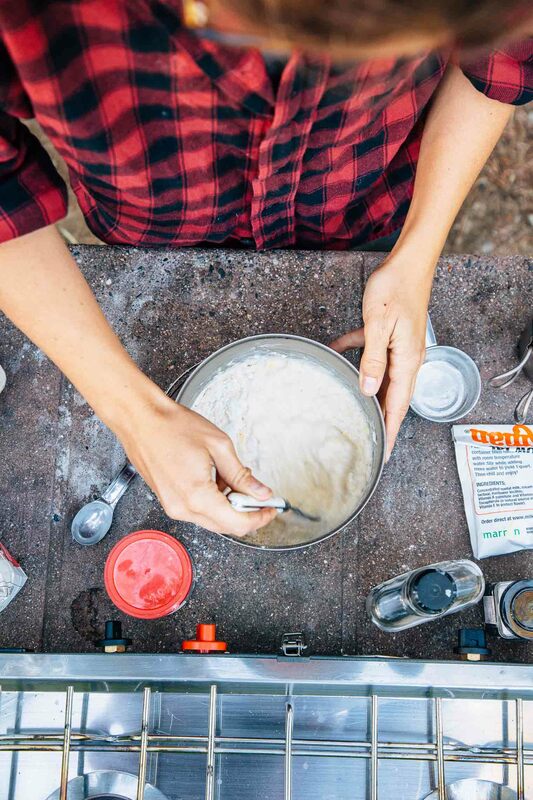 If we were just weekending it, we could have mixed all these ingredients together at home in a ziplock bag and then added the eggs and water at camp. But as it were, the mixing on-site was not a big deal at all. 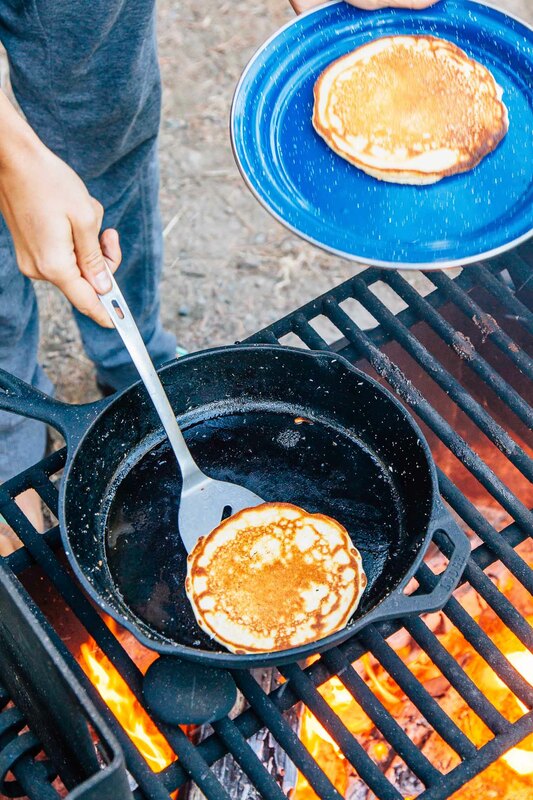 We wanted to cook our pancakes over the fire, so we pulled out our super-versatile 10-inch cast iron skillet. Since the pan is made entirely of cast iron, we could stick the pan directly over the fire and get a nice even heat. If you have ever cooked pancakes on a stovetop, you know that sometimes they can get burnt right in the middle and remain undercooked towards the edges. That’s because there’s a heat spot on your pan directly over the heat source, and it’s not distributing the heat outwards. By cooking over the fire with a cast iron, we got nice even heat from edge to edge. The other critical ingredient for pancakes which we rarely ever have with us? Butter. You need a little butter in the pan to get that beautiful golden crisp, but traveling without a cooler means that the last thing we want sitting in our hot car is a stick of melting butter. So instead, we decided to use: Ghee. Ghee is clarified butter – essentially butter that has had the milk solids removed from it. It comes in a resealable jar and is shelf-stable, making it perfect for camping. Because the milk solids have removed, it has a much higher smoke point that normal butter. Which, you can cook round after round of pancakes without the butter burning up in the pan. Cooking with ghee has been a total game changer for us and we’re looking forward to using it for more recipes where we want the distinct, unmistakable taste of butter. Since we were cooking over a fire pit that had an adjustable grate, we figured why not take full advantage of it. 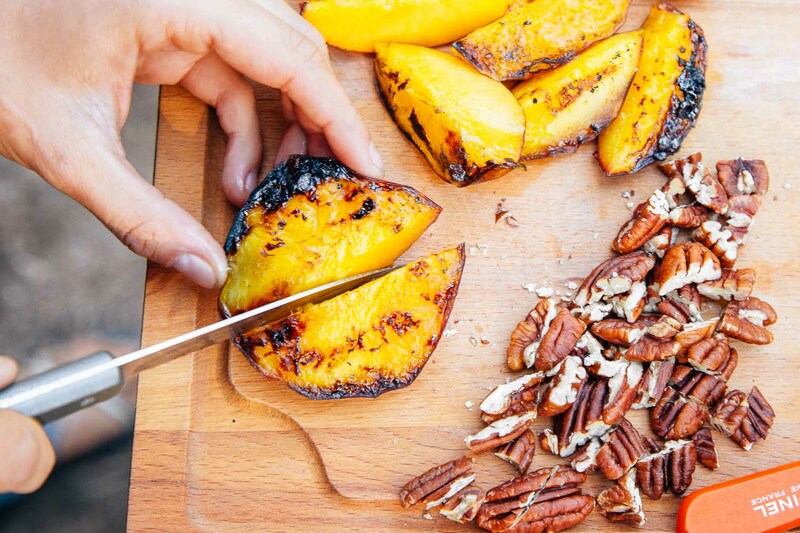 We sliced up a couple of peaches we had with us and placed them on the grill. We also chopped up some pecans that we sprinkled on top at the end. 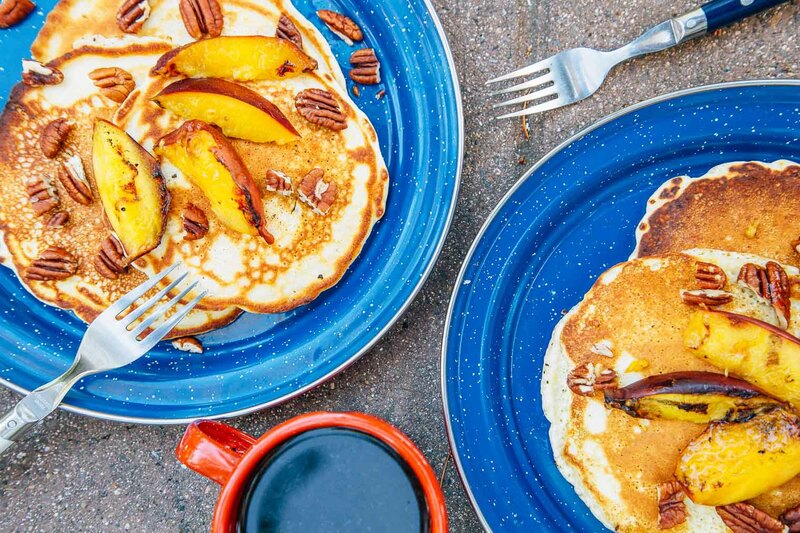 After tasting just one bite of these pancakes, we can’t believe we haven’t been making them this whole time. They were just that good. So look out everyone, we’ll be bringing you some new pancake recipes very soon! Heat a skillet over your campfire or camp stove over medium low heat. Add a teaspoon of ghee to the skillet and swirl to coat the pan. Pour 1/3 cup of the pancake batter into the center of the skillet and cook for a few minutes until the top begins to bubble and the edges have set (about 2-3 minutes). Using a spatula, flip the pancake and cook the other side until golden. Repeat with the rest of the batter, adding 1 teaspoon ghee into the pan for each pancake as needed. 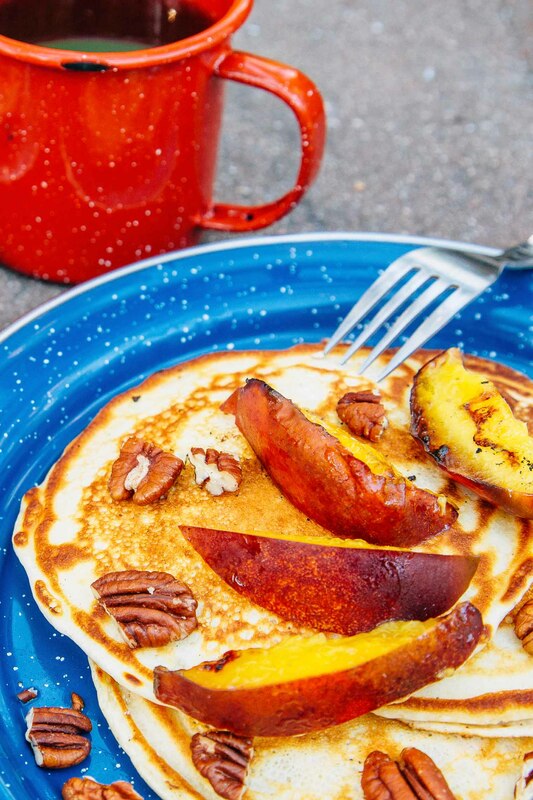 While the pancakes are cooking, place the peaches cut side down on the grill and cook until the fruit is just beginning to caramelize in places. Remove from the heat and slice. 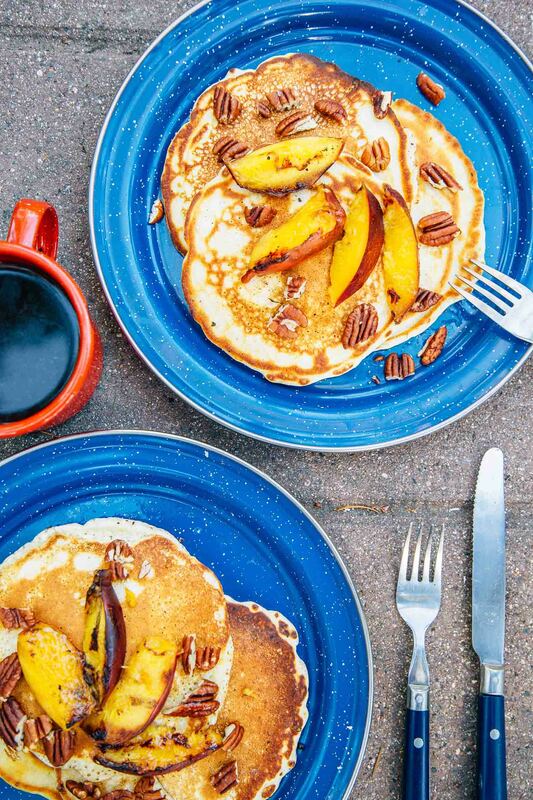 To serve, stack the pancakes, top with the grilled peach slices, chopped pecans, and maple syrup. Enjoy! What is your favorite way to serve pancakes? We’re all about out of the box toppings and we’d love to hear about your tried & true favorites! Just discovered your blog. Bookmarked it. Very good stuff. I loved the cooking recipe looks very yummy.